It’s Senior Day at the fair and and admission fees are waived for those older than 65. The gates open at 8:30 a.m. and the exhibit buildings open at 10 a.m. Cost for everyone else: $8 for youth and military; $11 for adults; children six and younger free. 11 a.m. - Senior Day activities on the North Lawn Pavilion run every hour until 3 p.m.
2:30 p.m. - Sea Lions Adventure on the North Lawn. 3:30 p.m. - Earl Wear nd Haywire on the North Stage. 5 p.m. - Open Horse Driving Classes, Horse Arena. 6:15 p.m. - Mark Yuzuik, hypnotist, on the North Stage. 7 p.m. - Gary Allan concert in the Grandstand. Tickets: Prices start at $25. When Daniel Ross was about 7 years old, he was assigned the first of many responsibilities on the family farm near Cheney: Feed the horses. By the time he was 13, Ross said, he was tasked with managing several hay fields and raising various livestock animals, including hogs, goats and cattle. “It takes a lot more to make a farmer than most people think,” he said. Now 16 and a sophomore in high school, Ross is spending his days at the Spokane County Interstate Fair, showing off a steer he’s raised during the past 18 months. Red, a 1,225-pound shorthorn/red angus crossbreed, sold at auction Sunday evening for $3 a pound, scoring Ross a hefty payout of $3,675. He boasted that was the second-highest selling rate of the evening. 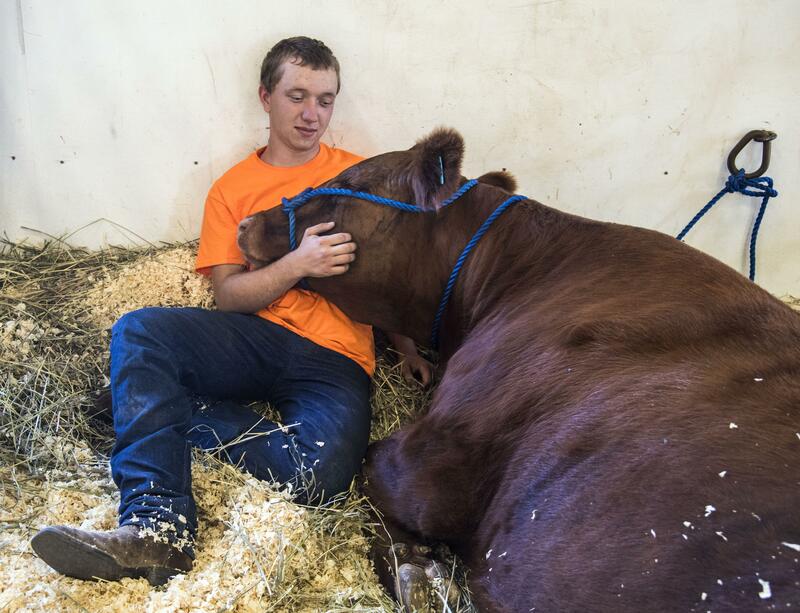 Ross, a member of Future Farmers of America, or FFA, said he carefully controlled Red’s growth by making his own feed blend of wheat, barley, corn, lentils, oats and a touch of molasses. “I formulated and did all the calculations to make this myself,” he said, grabbing a fistful of grains from a plastic bucket and sifting them through his fingers. Ross explained that his feed blend meets specific protein and carbohydrate targets. Ross said his family owns farmland in Cheney, Colville and Chewelah. After high school, he plans to study agricultural mechanics at Washington State University or a technical school in Yakima. “I want to be the guy that farms hire to come in and fix their equipment,” he said. In the meantime, Ross said he’s learning a lot at home and through FFA. And, he said, events like the county fair give him plenty of good excuses to skip days at school. Published: Sept. 11, 2017, 9:52 p.m.